IBM® ILOG® Visualization products allow you to create the most advanced graphical user interfaces for line-of-business applications, help users understand their data better, and react to a changing market faster and smarter. 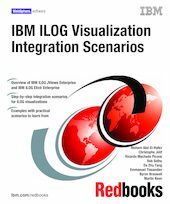 This IBM Redbooks® publication describes two IBM Visualization products: IBM ILOG JViews Enterprise and IBM ILOG Elixir® Enterprise. It provides detailed samples and scenarios covering how these products can be integrated with other IBM software such as IBM WebSphere® REST Technology, IBM Cognos®, IBM Mashup Center, IBM WebSphere Business Monitor and Business Space, and IBM WebSphere Dashboard Framework to provide Web 2.0 and Ajax visualization solutions. This book is targeted to application interface developers and programmers who develop highly advanced graphical user interfaces using IBM ILOG Visualization products with IBM Cognos, IBM Mashup Center, IBM WebSphere Business Monitor and Business Space, and IBM WebSphere Dashboard Framework.